As noted in my previous post – to the extent that it qualifies as such – I’ve been a little swamped lately. These reviews are a week late, but with this post and the review of Shadowland: Moon Knight #1 that I will most likely get to tomorrow, I should slowly be catching up. Thank you for you patience! There were two Shadowland tie-in issues out last week. Shadowland: Power-Man #1 introduces a new character who’s looking to pick up Luke Cage’s old name and fight crime in what is now the most hostile corner of Manhattan. Shadowland: Daughters of the Shadow #1 shows us how Colleen Wing finds herself drawn back into the world of Shadowland in the aftermath of Shadowland #2. Yes, this issue takes place after Shadowland #2 and we don’t know what happens, except that we’re told there was a big fight. There are differences as well as similarities between these issues. They both exist at the fringe of the Shadowland event, feature characters that are either C-listers or even a complete unknown and are personal stories that focus on the main character. They differ in that Daughters of the Shadow attempts to insert itself directly into the middle of the greater story (without necessarily setting itself up as required reading) while Power Man happily exists in Shadowland’s backyard. This is my first time doing a double review like this so I thought I’d let these two issues duel it out, category by category. I won’t necessarily declare a winner of each, but rather contrast and compare. We’ll se if the format works. New Power Man Victor Alvarez is a brand new character, but writer Fred van Lente does a pretty good job of fleshing him out in this first issue. We get a quick origin story that ties in directly with the events of Daredevil’s The List one-shot from last fall. For the most part, van Lente manages to “show, don’t tell” and we learn a great deal about Victor’s family, social standing (judging from his sister’s remarks, he’s virtually friendless), and raison d’etre without having every little thing meticulously spelled out. The end of the issue also hints at a dramatic connection to Luke Cage, the “old” Power Man. Colleen Wing is certainly no newcomer to the Marvel Universe, but rarely gets as much undivided attention as she does in this issue. Here, writer Jason Henderson has the task of giving us the needed insight into Colleen’s personality and provide us with enough of a background to support the developments of the issue that have Colleen running back to the man whom she just fought in Shadowland #2. We’re giving two important motivations for this slightly irrational decision. The first is set up in the opening scene when Colleen attempts to rescue a group of women who are victims of trafficking only to have the whole thing turn sour at the hands of the authorities. Even in the so-called heroic age, Colleen experiences. the frustration of having the bad guys fall through the cracks of the system. The other reason for Colleen to seek out Daredevil is because she’s clued into a mystery that begs for her attention, one that involves her family history. Aside from Victor and his family, Shadowland: Power Man #1 features appearances by both Luke Cage and Danny Rand (as well as a Spider-Man cameo). These two are cleverly brought into the story when one of the Hand ninjas Victory fights in the first half of the issue recognizes one of his moves as distinctly K’un Lun. This set-up requires some amount of willingness on the part of the reader to just go along with the story, since I’m not sure I buy that the cannon fodder known as the ninjas of the Hand would know that much about what Danny Rand does and does not teach in his dojo. Minor objections aside, the inclusion of Luke and Danny in this story feels organic and their characters are well-written. Last, but not least, Colleen is introduced to the Nail, a group of women we’re sure to learn more about next issue. Thus far, Shadowland: Power Man comes across as the more compelling issue. Shadowland: Daughters of the Shadow clearly has the more obvious connection to the main event. Not only does it actually feature Daredevil, Colleen was also one of the select team of heroes who went to confront him in last month’s issue of Shadowland. We also learn of her familial ties to the Hand and her own background of being trained as a samurai in Japan makes her a natural fit for the role she is cast to play here. On the other hand, with the story being forced to line up with the main event much more closely than is the case for Shadowland: Power Man, there are also constraints placed on the story that makes certain elements seem just a tad forced, and the choice to have this issue set after Shadowland #2 (an issue which ended in a cliff-hanger, as you recall) makes for a slightly awkward read. Shadowland: Power Man, on the other hand, takes place in the periphery of the main event and, like Blood on the Streets, seems to benefit from this approach. This doesn’t mean that there aren’t clear ties to Daredevil, but aside from the appearance of some Hand ninjas and the new Power Man’s origin, this story feels as if it could work in a non-Shadowland setting as well. Neither one of these mini-series feel like required reading to me, but if I’d have to recommend one based on pure reading pleasure, Power Man gets my vote. Both of these issues are pure set-up. They introduce the characters involved, take them from A to B and end in cliff-hangers. As such, they get the job done. While not specifically a “plot issue,” I was surprised by the picture painted of Daredevil’s reign in the Daughters on the Shadow issue. While Colleen is working out in her living room, she’s watching the news and we hear the anchor talk about people in Hell’s Kitchen who “claim a mysterious army of ninjas has replaced the police, operating out of an actual castle.” Wait a second here. Shouldn’t it be a well-established fact that there is an actual caste standing in the middle of Hell’s Kitchen, and shouldn’t it be 100% verified by all affected authorities that the police has left the area? This feels like sloppy writing to me. This issue aside, other things related to the plot of these issues have been covered elsewhere, so let’s get to the next section. I’m not really feeling Ivan Rodriguez’s art in Shadowland: Daughters of the Shadow. Some panels are beautiful, but there are inconsistencies that make the characters, particularly Colleen, look like she’s about four different people. There are also an obvious continuity goof in this issue, such as panel that is set decades in the past but has ninjas dressed like modern-day “Daredevil ninjas.” What makes matters worse is that the coloring (by Jorge Maese) ranges from blotchy to just feeling over-worked. Sometimes, less is more, and much of the art would have benefited from not being covered in oddly angular shaded areas. The art certainly didn’t ruin my reading pleasure, but it left more to be desired. Penciler Mahmud Asrar on Shadowland: Power Man impresses with his dynamic artwork which I quite enjoyed. It lets the story do its thing and brings it up a notch with a nice mix of close-ups, interesting perspectives and explosive splash pages. 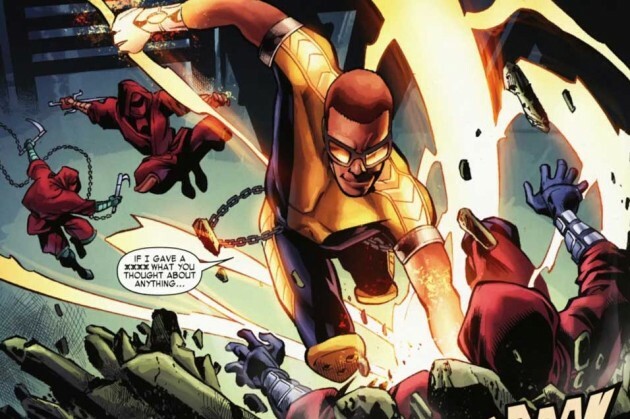 He and the rest of the art team (inker Scott Hanna and colorist Bruno Hang) help make the new Power Man’s debut a nice well-rounded package deal. Since space simply wouldn’t allow putting the scores in the title of the post, I’ll hand out my scores here. Both of these books have strengths and weaknesses, but Shadowland: Power Man was the more enjoyable read for me and scores a 7.0/10 whereas Shadowland: Daughters of the Shadow receives a lower, but still passing, grade of 6.0/10. As should be expected once you see my name above a comment, it’s going to be laboriously long. I should just start my own blog and save TOMP’s pristine beauty from my rants. Stop reading now if your patience is not at its optimal level. I came away with the opposite reaction than Christine: I thought “Daughters of the Shadow” was better than “Power Man” – and partially owing to the fact that DotS *was* involved in the Shadowland storyline. I want my tie-ins to be *tied in*. The fact that PM may be able to stand alone (and it’s too early to call just yet) detracts from my enjoyment of it as a Shadowland tie-in. It feels like a marketing gimmick to lure in the reader (slap “Shadowland” on the cover and trick the unsuspecting), as opposed to an organic fleshing out of the event. Simply, I found the draw of DotS – lethal ninja assassins known as the Nail – more compelling than the notion of a newly-super-powered teen who sells his services to the highest bidder. The former has a great deal of intrigue; the latter is more routine in the super-powered world. That said, the art in PM was considerably better than that in DotS. My only complaint about PM’s art was that I had no idea Victor Alvarez (or his family) was Hispanic until they started speaking Spanish: they all look black. But, both of these stories were riddled with little errors and questionable bits that really detracted from my enjoyment. I’m a details nut – I know I’m nitpicky to the extreme. And I’m capable of letting a few foul-ups occur without it becoming burdensome, but both of these books just needed some more careful editing. 1. In PM, we have ninjas running around without understanding the basic Hand rank structure. They refer to “the Daredevil” as their daimyo. Daredevil is Shogun of the Hand; White Tiger is the Daimyo for North America. 2. The Hand ninjas seem confused that they didn’t disappear into a puff of smoke. They also didn’t seem to suffer damage sufficient to *kill them*. That’s usually a prerequisite. If they did suffer that much damage at Victor’s hands, then all the criminals present also did and Hector is a crazy, murdering psycho (Lil’ Punisher) who has already killed at least six people. Since no one mentioned that, I’m guessing it didn’t happen. 3. Victor rescues his charge and calls her “Elle” – in quotation marks. Why? Is he making up a nickname? Is this a reference to her name being Luann, as only revealed later? Even if it is, why is it in quotation marks? And why would it be spelled out phonetically? Later on, Danny telephones Luke and literally refers to him only as ‘L’, and to himself as ‘D’. Aside from this sounding outlandishly stupid, it seems to kill the need to spell out nicknames phonetically if it’s just a letter. 5. Luke Cage meets with Spider-Man on top of a billboard in Times Square. How did he get up there? And how is he going to get down without causing property damage? 6. Shang Chi just leaves Danny to defend himself against three ninja assassins? I know he’s a badass and all, but how does Danny think that’s a good idea? I would play it safe when it comes to ninja attacks. What if Danny pulls a hamstring or something? 1. Is Colleen’s body suit made of some silver, reflective material? She kind of looks like the Silver Surfer. 2. What persons agree not to press charges when a sword-wielding crazy woman busts into their business, does massive property damage, and SLICES OFF THE FINGERS of an employee? That’s a hell of a thing to forgive. It’s also a crime that the police would be basically obligated to arrest her for. You don’t really need witness testimony when you have severed fingers. 3. Why did Matt leave Colleen a secret message on the mirror? Why not just invite her over (as he does to someone he wishes to ally with in “Shadowland: Moon Knight”)? And once she arrives, why send guards to attack her? Why permit her to KILL YOUR MEN? Here’s my idea: Hand ninja comes to window and knocks. He hands Colleen a note that reads: “Your hands don’t have to be tied. Oh, and I have info about your mother. Love, Matt. P.S. I got in some great plum wine.” Colleen walks in Shadowland’s front door. The end. 4. Following up Christine’s point about horrible news reporting, how can Colleen Wing be unidentified by the local news? She’s a sword-wielding vigilante who had a public business with Heroes For Hire. She’s closely associated with Misty Knight, who apparently is the publicly-known pregnant girlfriend of Danny Rand, a former billionaire and known superhero who hangs around with Luke Cage, an Avenger. These are FAMOUS PEOPLE. 5. If the Shroud and Misty knew that ninjas were sneaking into Colleen’s apartment while she slept, why didn’t they act? Even if the Shroud only saw the ninjas leaving the apartment, he didn’t think it a worthwhile idea to go in himself and make sure she was still alive? Instead, Misty hangs outside Colleen’s apartment at 3 in the morning in case she decides to go for a walk. Ring the door bell and talk to her! 6. On the page after Colleen and Misty talk, are all those cars perched perilously close to a sheer edge? What is going on there? 7. 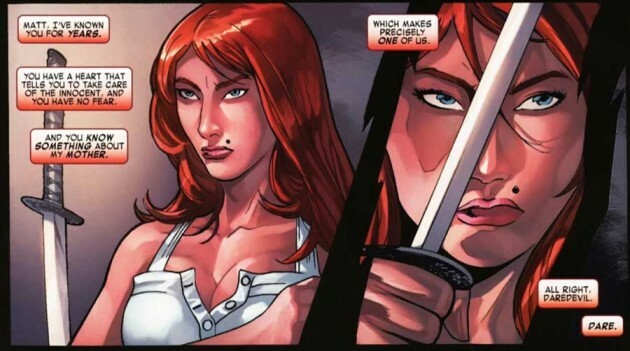 The history of Colleen Wing after the main comic explicitly notes that “Colleen follows the samurai tradition which states that a warrior’s blade should only be resheathed once drawn if it has taken an enemy’s life and tasted his blood”. Unfortunately, Colleen never sheathes her sword – she doesn’t seem to own a scabbard. (She carries it under a trenchcoat like Connor MacLeod.) In fact, in her apartment she just jams it into the floorboards and leaves it sticking out of the ground while she watches tv! Her landlord is definitely keeping her deposit. Thank you. Literally, absolutely the funniest and most enjoyable commentary I’ve ever read on anything I’ve written. @Jay – Well, I’m glad you’re able to enjoy it. Your issue was certainly a heck of a lot more interesting than my proposed sit-down between Colleen and Matt over tea and biscuits. I’m very psyched for issues #2 and #3! I’d think you were kidding about that extradimensional pocket if those things didn’t actually show up all over the Marvel Universe. If you thought your car keys were hard to find when limited to just THIS dimension, watch out! My theory was that Colleen had had some sort of bionic leg attachment that allowed her to sheathe her sword IN HER LEG – yes, like Robocop’s gun.